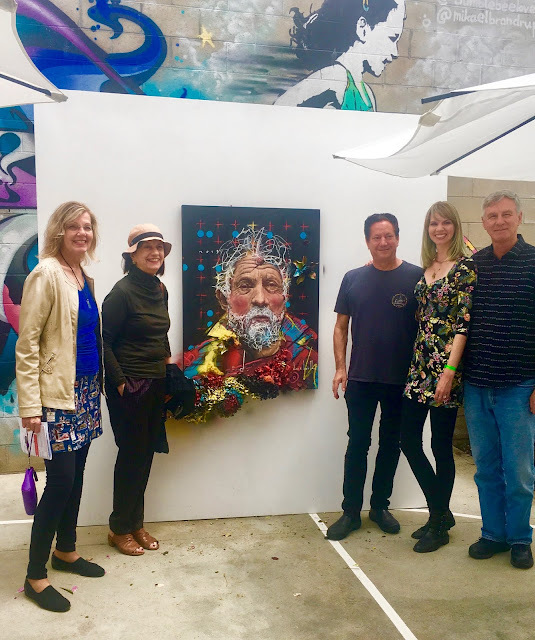 Blogtown: The 2018 Venice Family Clinic Art Walk & Auctions - Art And Healthcare For Everyone! 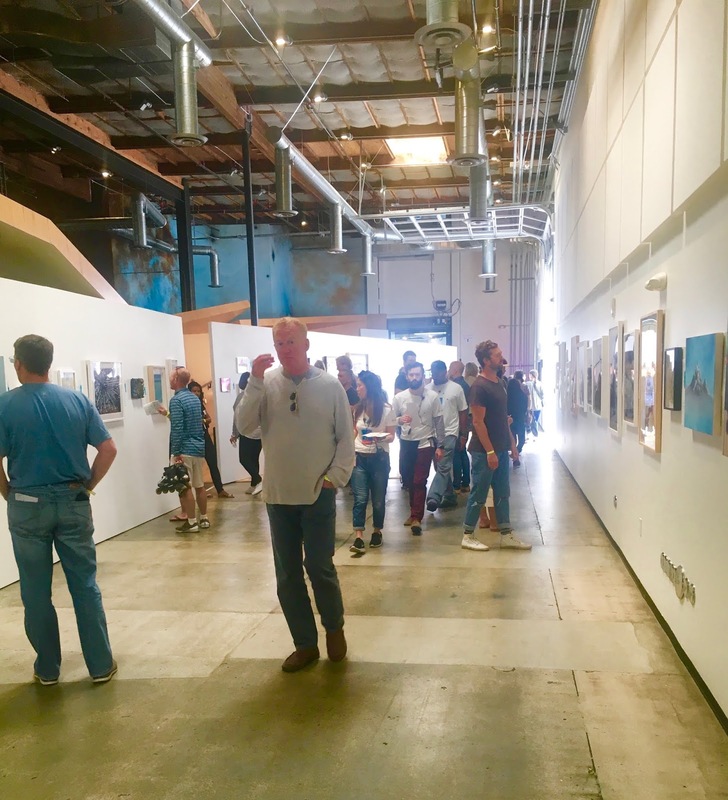 The 2018 Venice Family Clinic Art Walk & Auctions - Art And Healthcare For Everyone! 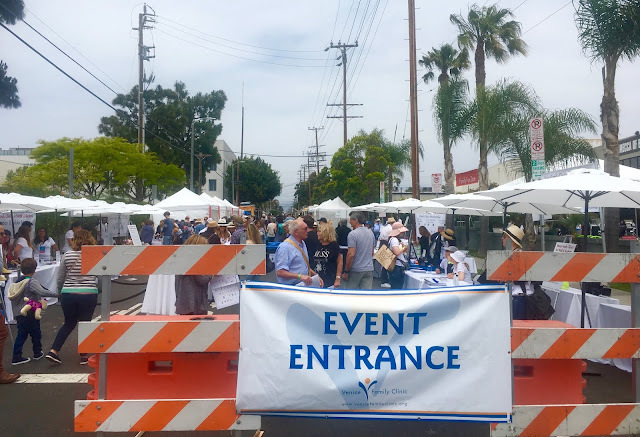 The 2018 Venice Family Clinic Art Walk & Auctions took place yesterday, and showed once again - for the 39th time! 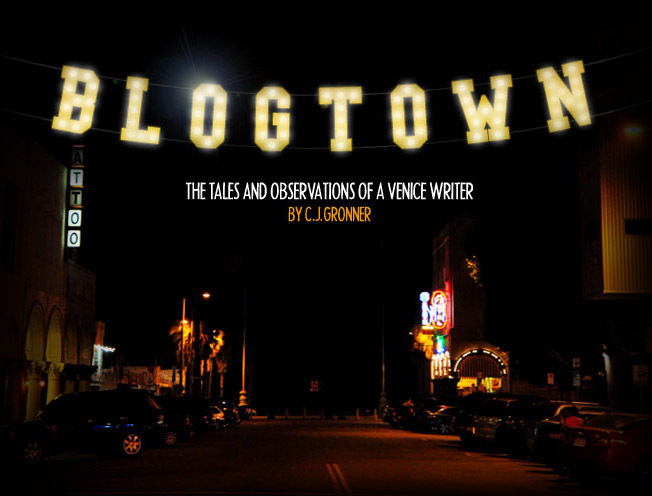 - why it is an annual event that Venice looks forward to all year. My dear friend, Deb, was coming west to spend the day at the Walk with me, and I couldn't have been more thrilled. The May Gray burned off as soon as we'd finished fueling up at The French Market, and we were off to Google headquarters to pick up our maps and wristbands for the studio tours. The entire area was already packed by the noon starting time, and people were ready to check out some ART. And there was SO MUCH art. Phew. 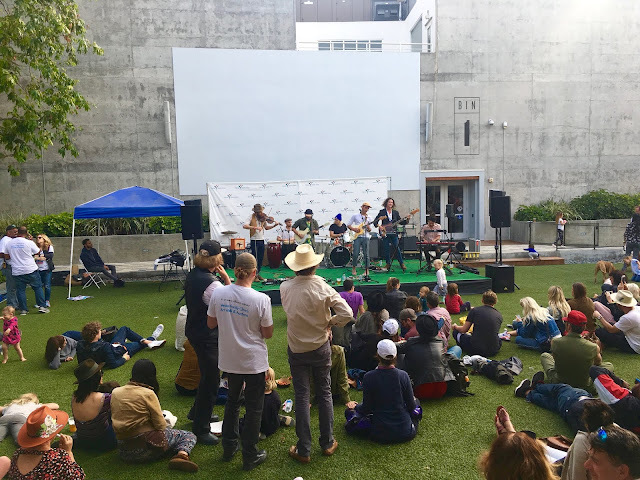 The Google headquarters is always a good place to start, and it's free, so it really is an event for the whole community. Outside, there was a kid zone, food trucks, an art car "museum", arts and crafts booths, workshops, and the merch area, where you could pick up this year's t-shirt designed by Alexis Smith with a print of her "Stairway To The Stars". Own it. Love it. 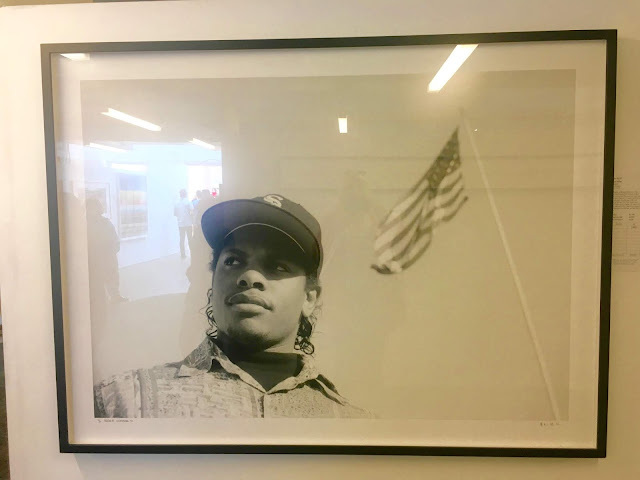 The silent auction inside of Google features so many artists you don't really even know where to begin. 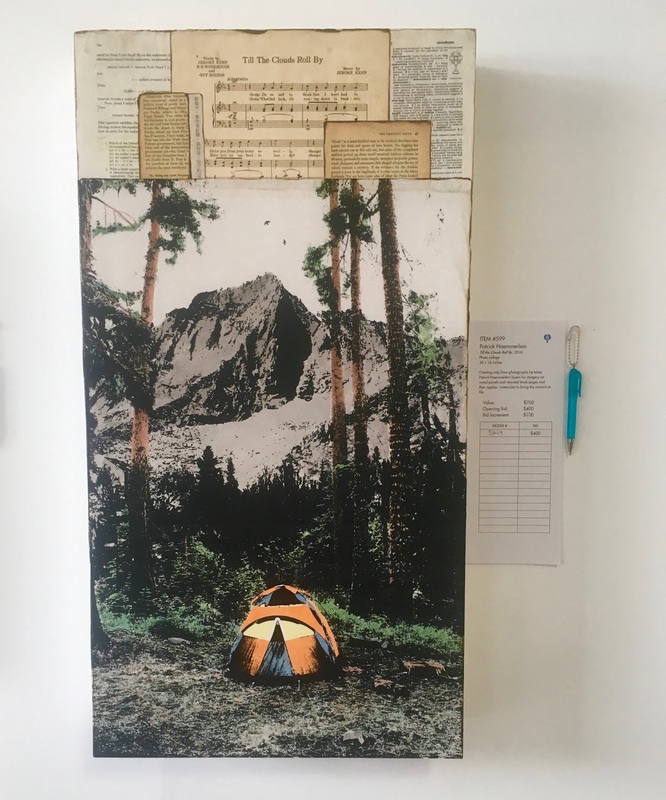 I wanted nearly every piece, and with so many bids being placed, you can see why this is the Venice Family Clinic's biggest fundraiser of the year. 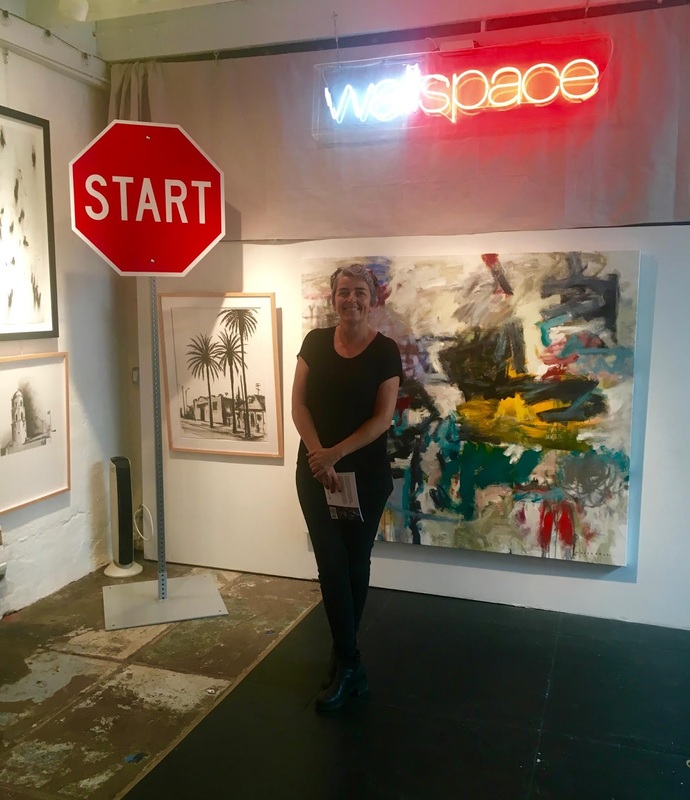 Art for good! My first favorite was Till The Clouds Roll By, 2018 by Patrick Haemmerlein. I was clearly outbid, because I didn't get back in time and I didn't win it. Boo, but happy for whomever got this great piece of art. I also loved Pacific, 2016 by Lynn Hanson. 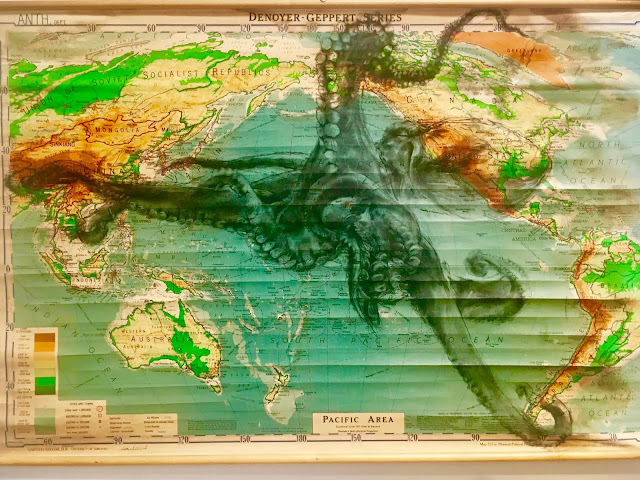 A sea painting on a pull-down map! Ooooh. A piece by Sam Durant (also an honoree of the event, and a past client of Venice Family Clinic) was really the whole point of the fundraising day, called, Everyone Deserves Healthcare, 2018. The serigraph was created especially for this year's Art Walk. It spoke the absolute truth, and served to remind everyone what the day was all about. Another honoree of the event was the late Ed Moses, who was represented by his son, Andy Moses, and by a gorgeous live painting that was done to remember this Venice legend. 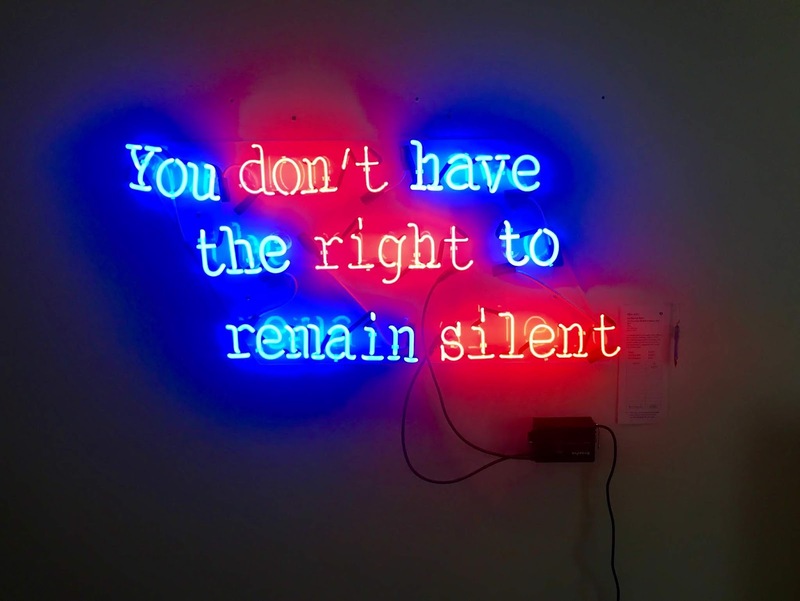 Guillermo Bert told us You Don't Have The Right To Remain Silent, 2017 - and you don't. Not in these times. There were several works that touched on current events, but this one was one of the most pointed. 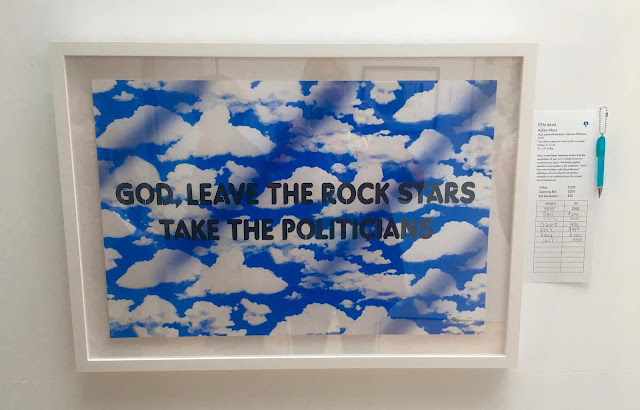 In that same vein was another favorite ... God, Leave The Rockstars Take The Politicians, 2018 by Adam Mars. My sentiments exactly. "It's on every Collector's Calendar" was one of the event's tag lines, and if you are a collector of photography, there was a TON for you to choose from. Alfred Stieglitz (!) to Danny Clinch, John Van Hamersveld's Muddy Waters to The Eazy E by Mike Miller. And if you were lucky, you could get it for a steal. 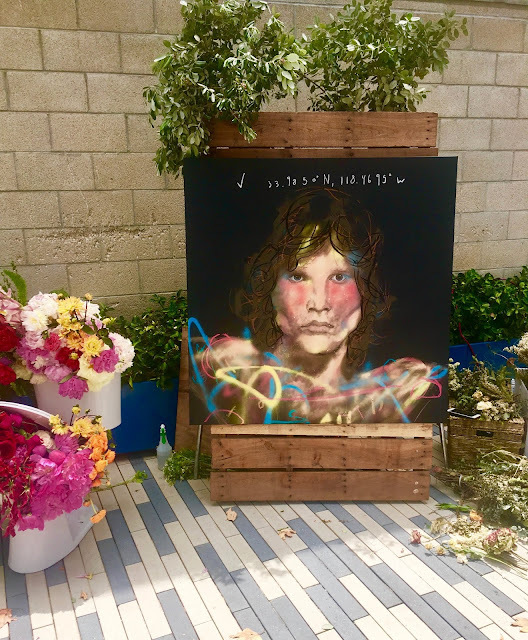 There was live painting going down outside, and Jim Morrison was being both painted and adorned with flowers as he watched over the live music and beer garden in the patio outside of Google. Love Street vibes, for sure. The clock was running on the Art Walk, so we set out to see how many artist studios we could get to while they were all still open. The complex next to Gjusta was up first, and I revisited my new friends from Wallspace, who were showing several of the works we saw at the Venice Art Crawl three days earlier. 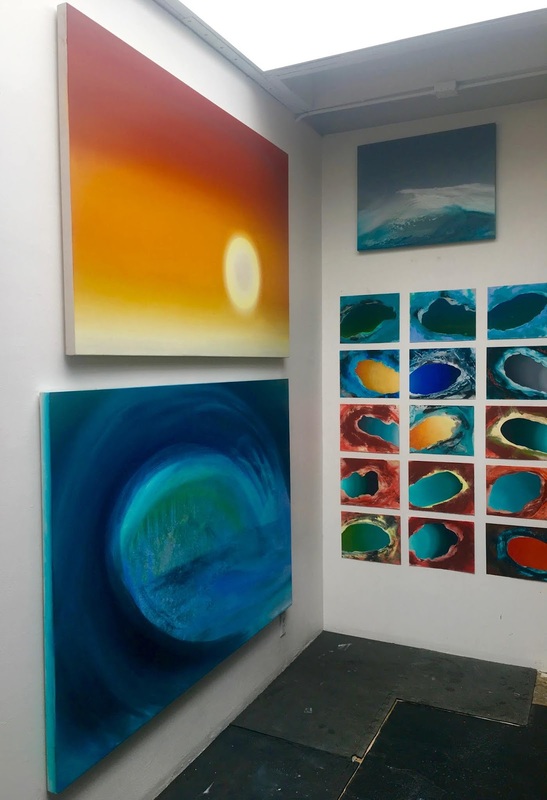 They were popping up in MB Boissonnault's space, so I got to see her excellent, wave-like works again too. Up the hall, I checked in with Marty Katon, who was chatting with visitors while a pigeon in a cage cheeped along. 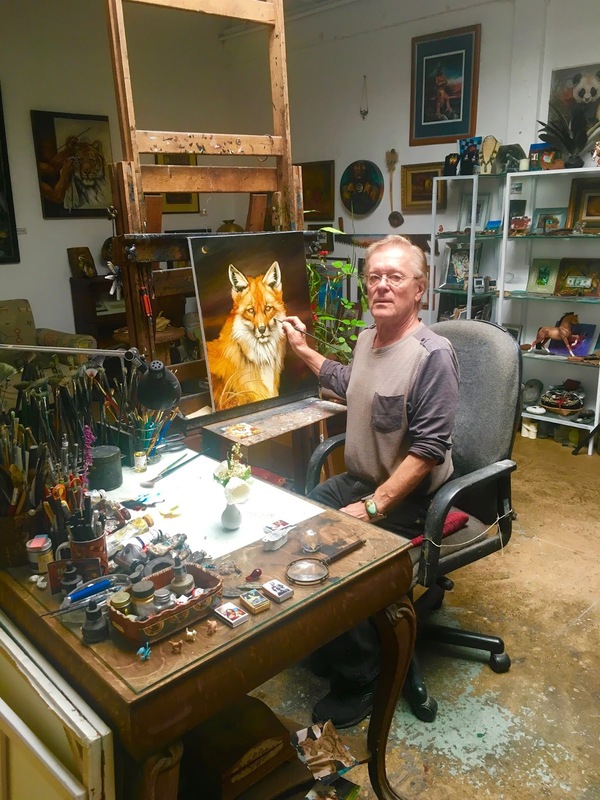 His wildlife and Native American pieces are so great, and he's even now doing original oil paintings on bracelets - as seen on such trendsetters as Rihanna! 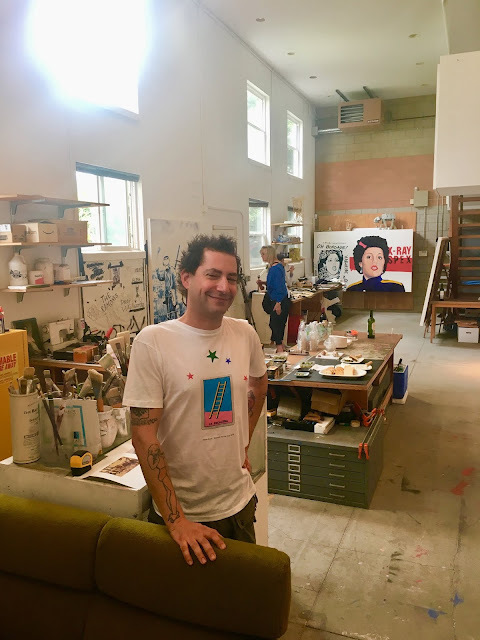 I was delighted to find that my friend, William Attaway, was back in his own space just a few doors down from his longtime studio next to Gjusta. 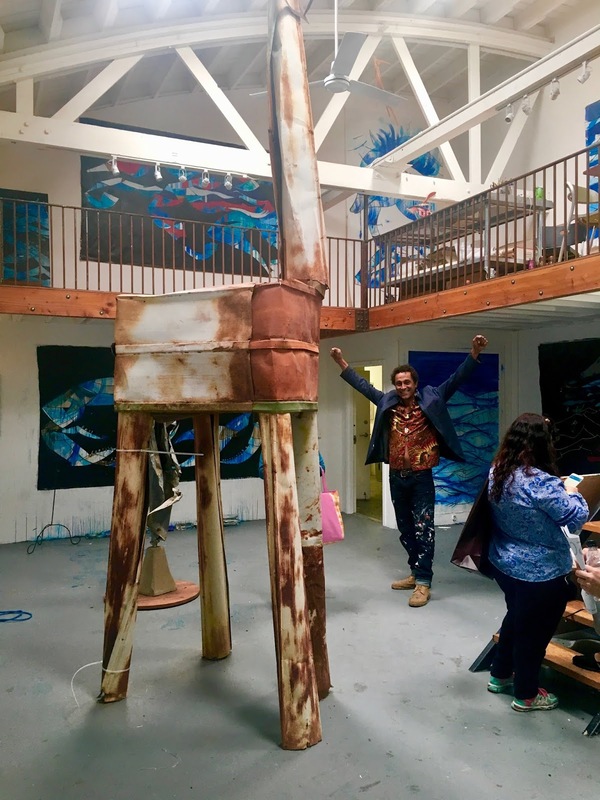 There are new works, including a giant giraffe sculpture that he did at the "Bombay Beach Biennale". Attaway is a Venice classic, and Art Walk would never be the same without his outstanding work on display. Welcome back, Attaway!!! (not that it ever felt like you were gone). 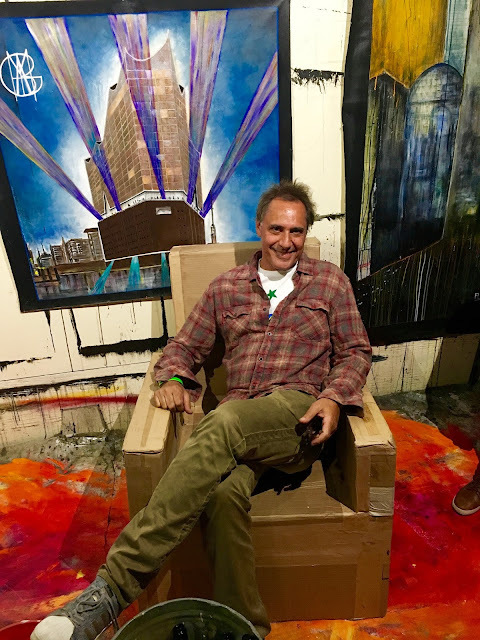 Jim Budman's studio is always a fun place to visit. He's always rearranging and adding things, and it's a treasure chest of interesting curios and art. Plus Mr. Budman is always a treasure chest of stories and bon mots himself. The only drag is that you don't want to really linger any one spot, because there is just so much to see all over town ... so off we went. 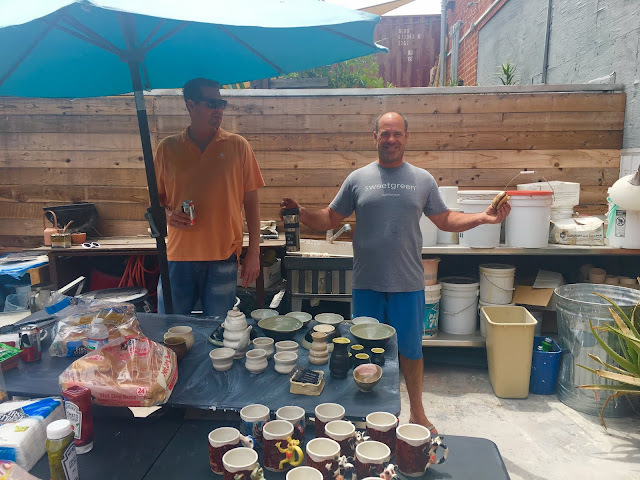 It was tempting to stick around Patrick Johnston's ceramic studio to enjoy a cold Tecate, but man, the art. 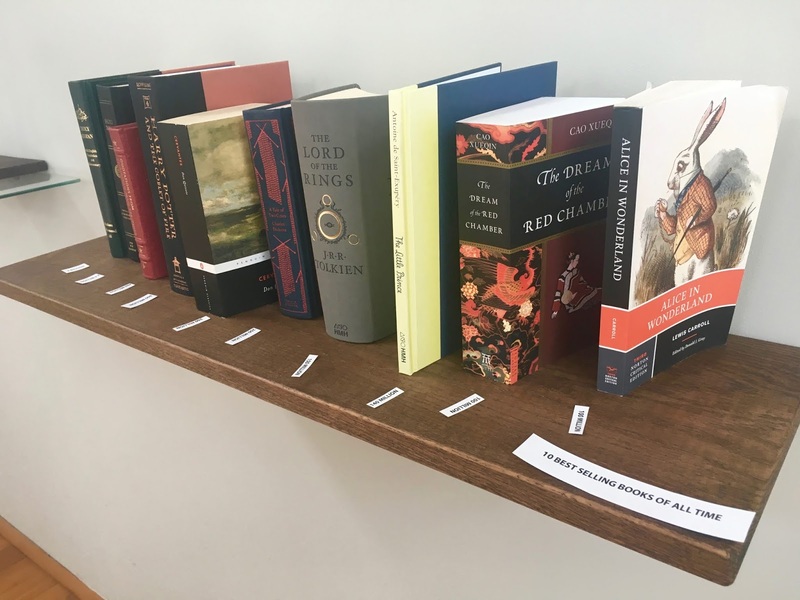 We admired his collaboration pieces depicting Venice scenes, and I vowed to return for one of my own one day soon (when I have my own shelves again). Hugs and well wishes were exchanged and back to it we went. 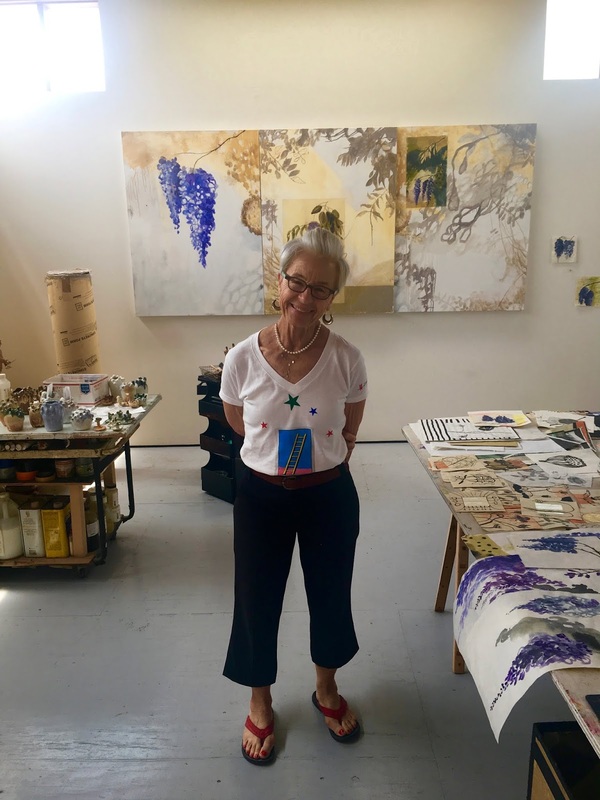 We headed over to the studio of Alejandro Gehry, the son of architect, Frank, and an impressive artist in his own right. His series of the women of punk rock (Belinda Carlisle, Siouxie, etc...) were on display, as were his new works of women in military helmets. He was there explaining these works to some visitors when we arrived, and said that he got the idea for the concept works when women were allowed to be in combat. I would have loved to stay and hear more ... but more art was calling! 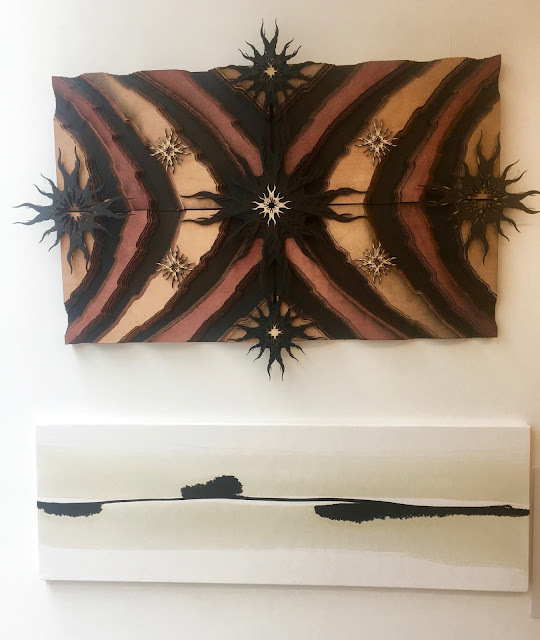 My former next door neighbors on Westminster were showing in their home studios, and Brad Miller and Mollie Favour both showed their fantastic works off. To get to Favour's studio, you took a wooden staircase covered with wisteria to get there. Inside, Favour was working on paintings featuring those same wisteria, and they were lovely. We thanked them for sharing, and took off over to Broadway to see still more art. The massive studio of Greg Falk and his wife, Tanja Skala, was our next stop, and was a highlight of the Walk, as it always is. 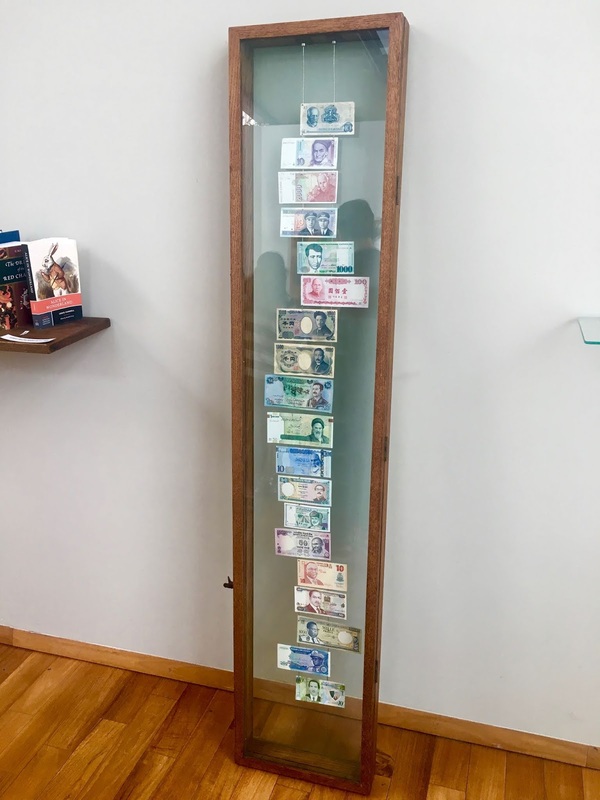 Falk was showing his super interesting work upstairs, like the piece that displays world currencies according to their longitudes, where he found that the melanin in the faces gets lighter the more north you go. Skala was leading about a dozen women in a performance art piece that voiced female affirmations as they quoted Maya Angelou's Still I Rise. We were their only audience at the time, and it gave me chills as it gave their legs bruises. 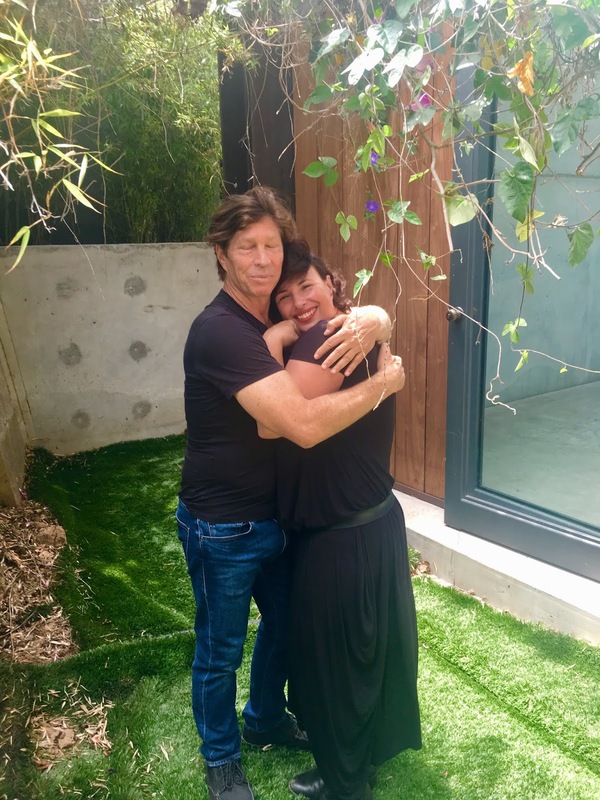 Powerful stuff, and I'm so happy to call this creative force of a couple my friends. Wow. 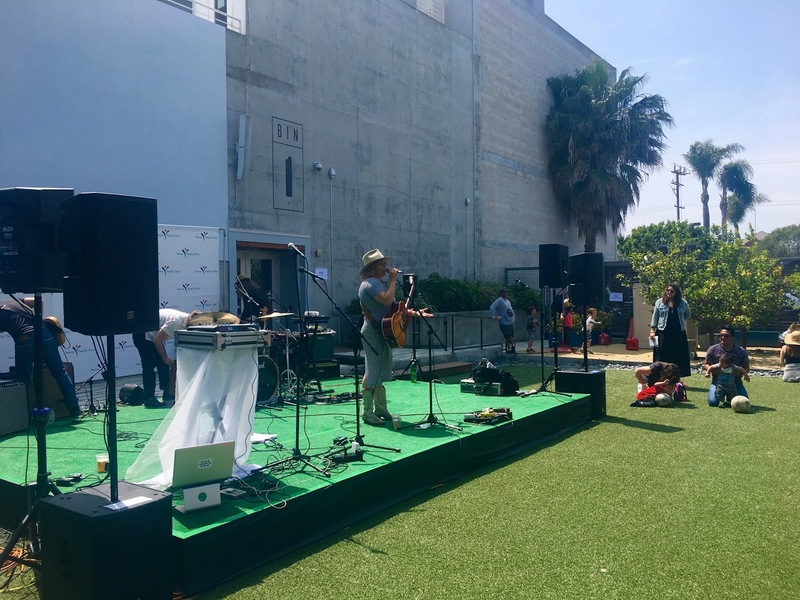 As we were still pretty close to Google, and my friend, Lacey Cowden, was about to play in the courtyard, we kicked it back over there to enjoy Lacey's tunes, and also take a quick breather in the shade (as it was now a bright, sunny day after the marine layer burned off). 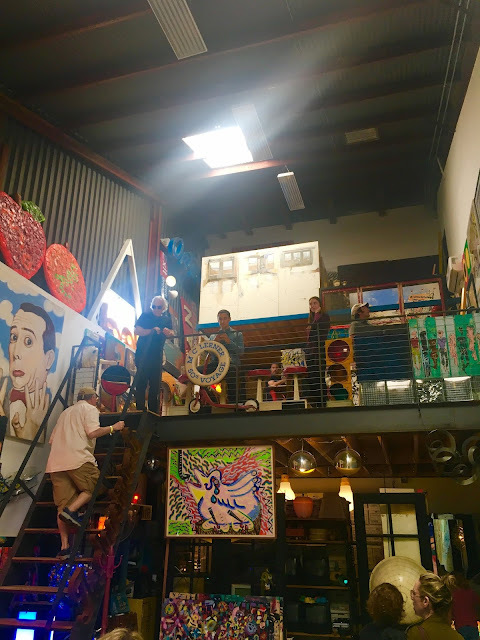 We couldn't get too comfortable, though, as most of the other studios were further away, and we needed to hop on one of the shuttles circling around town. 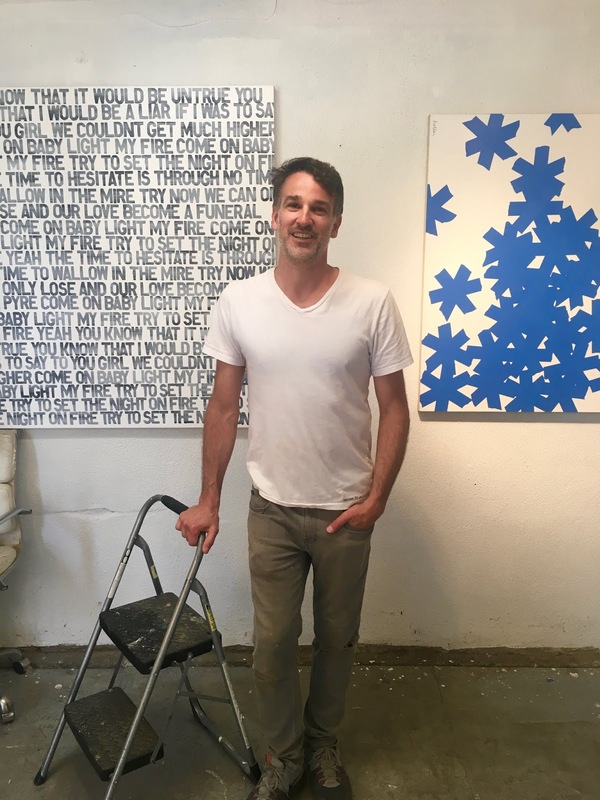 We got on a blue line shuttle, and headed for the home studio of Matthew Heller. Heller's great works with song lyrics and asterisks are some of my current favorite local artworks, and it was fun to get to see where they were created. 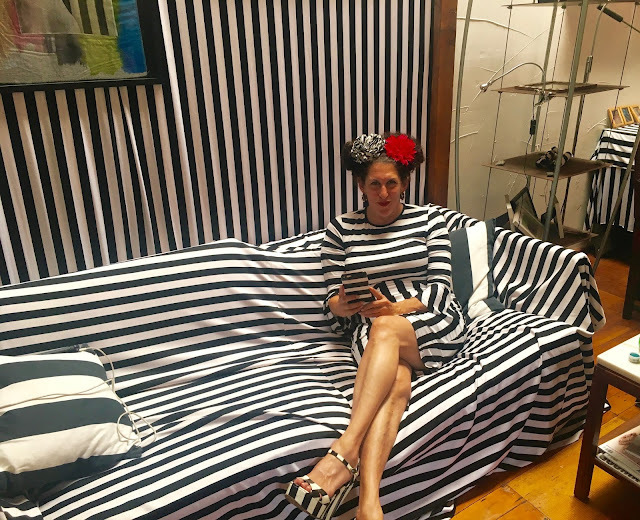 The wonderful Amy Kaps' pad was our next stop, and she was there in full black and white striped regalia. I was overjoyed to hear that she has been booked to do one of her performance pieces for RedCat Theater in its upcoming season. Richly deserved, and not to be missed! 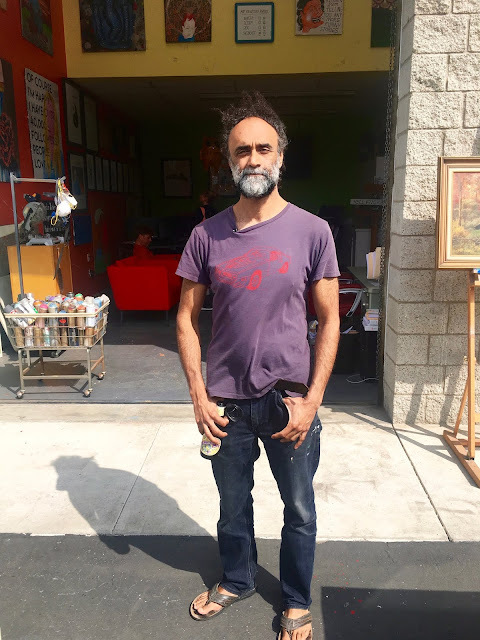 Rohitash Rao's studio was our next visit, and I was real happy to hear the news that he gets to stay in his space that he was about to be booted from - thanks to Wabi Sabi, who offered to share the space with him. That's how a community that wants to keep its artists living and working nearby works together to make it happen. NOT by jacking up rents so that no one cool remains. Ahem. Rao's art is some of the very best around - and wittiest - around. I love every single thing, but especially the little plane in the big sky with a bubble saying, "Excuse me, Stewardess? I speak jive." Love. I quickly stopped by Gary Palmer's studio, where we drank the last of his wine, and saw more of the work that we'd been teased by over at the silent auction. Now it was four, and as many of the studios were closing down, and Deb had to get back East to let her dogs out, it was back to Google for me, where several friends had been texting, "Where are you?!" from. Now was the time to enjoy a little wine and the musical stylings of Foxtrails playing for a now extra-packed lawn. So many friends and local acquaintances were there, you couldn't even finish an entire conversation ... and I loved it. By the time we did our fair share of gabbing and wine drinking, the food trucks and all that outside were closing up shop, and we decided to hit Hal's for happy hour and a resting of the feet. More friends congregated there, and it was a whole posse that then headed over to Flavio Bisciotti's studio to help him celebrate his birthday, that also happened to fall on this day. Friends reveled and congratulated him on a new year, and admired his work while we were at it. Oh, and there was more wine. Cheers, Flavio!! It had been a super long day (after a super long night staying up to watch the royal wedding the night before and I was BEAT). As I headed straight for the bed waiting for me, I was walking down Abbot Kinney and got escorted part of the way by the passing Venice Electric Bike Parade! What a wonderful and fitting conclusion to a day that is always about Venice and the arts. Spectacular! 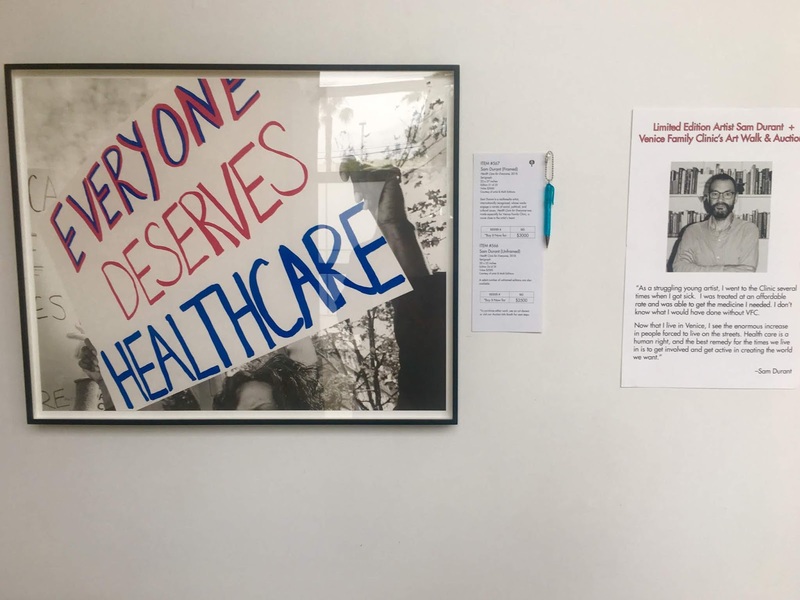 Once again, EVERYONE DESERVES HEALTHCARE!!! And the Venice Art Walk happens each year to bring us closer to that truth, and that reality. THANK YOU, THANK YOU, to all involved in the creation and execution of this wonderful annual art extravaganza. We love the ART, and we love you, Venice Family Clinic! 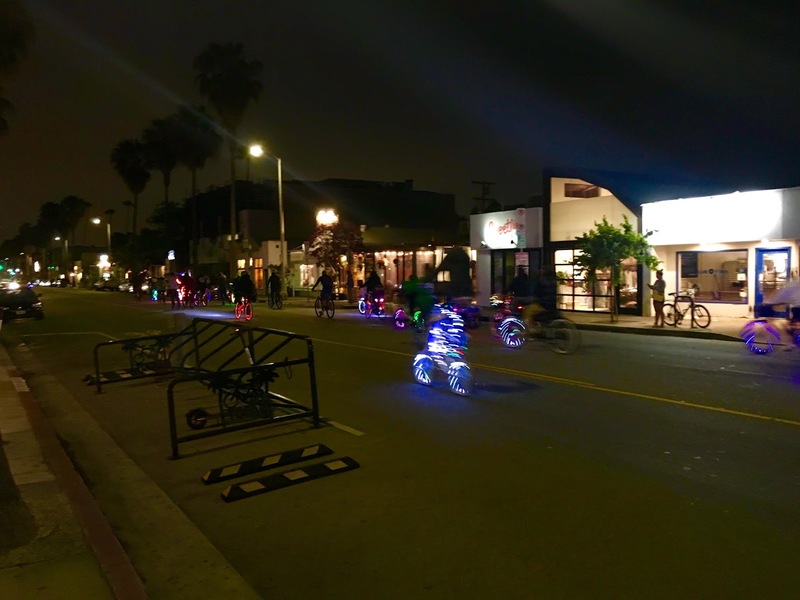 Until next year ... Keep art in Venice alive every day!